Draft: 2011, Boston Red Sox, CAth rd. 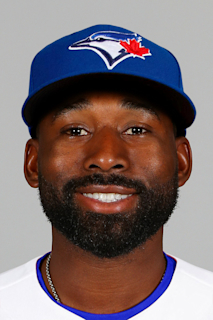 Full name is Jackie Bradley Jr. Married to Erin...The couple had a daughter, Emerson, in June 2016. Signed by Quincy Boyd (Red Sox). Is a distant relative of NBA legend Michael Jordan...Jordan's grandfather and Jackie's greatgreat-grandmother were siblings. Led University of South Carolina to the 2010 National Championship with a .368 AVG...Named Most Outstanding Player at the College World Series. Played for Hyannis of the Cape Cod League in 2009 and for USA Baseball's Collegiate National Team in 2010. Graduated from Prince George (VA) High School. 2018: Earned his 1st career Rawlings Gold Glove Award for CF...In 144 games, hit .234 (111-for474) with 76 runs, 50 XBH, and 59 RBI. Was hitting .161 through 5/19 (38 games), but in his remaining 106 games he batted .260 (91-for-350) with a .793 OPS...In his final 76 games (beginning 6/24), posted a .282/.349/.502 batting line (72-for-255). Stole a career-high 17 bases and was caught once...His 94.4% success rate ranked 1st in MLB (min. 15 attempts) and was the best mark by a Red Sox player since Dustin Pedroia in 2008 (95.2%). Recorded 9 assists from CF, tied for most in the AL... His 3 double plays as a CF ranked 2nd in the AL (Trout-4). According to FanGraphs, his 7.2 ultimate zone rating as a CF ranked 1st in the AL and 3rd in the majors. Was rated the AL's best defensive outfielder in the annual Baseball America Best Tools survey, which polls managers, scouts, and executives. The Red Sox were 12-0 in games in which he homered and 36-3 (.923) when he had at least 1 RBI. 50 of his 111 hits went for extra bases (45.0%), including 35 of 69 (50.7%) from 6/26 through the end of the season...The Sox went 39-6 (.867) when he recorded at least 1 XBH. In the 81 games in which he batted 9th, hit .264 with an .805 OPS (70-for-265, 8 HR, 37 RBI). On 8/10 at BAL, went 3-for-4 with a double, a triple, 1 BB, 1 RBI, and 4 runs scored. In his final 41 games (beginning 8/10), hit .304 with an .885 OPS (41-for-135, 19 XBH). Hit 2 HR in the 1st game of a doubleheader on 8/11 at BAL, a 5-0 Sox win. Recorded 2 RBI in 3 straight games from 8/28-30. Tripled and homered in the Sox' 6-1 win at CWS on 9/1. Ended the season with an 8-game hitting streak from 9/19-30, posting a .389 OBP in those games (9-for-31, 4 BB, HBP)...POSTSEASON: Appeared in each of the Red Sox' 14 postseason games, recording a .200/.360/.475 batting line with 3 HR and 10 RBI (8-for-40, 5 XBH, 9 BB, 1 HBP). Named MVP of the ALCS after going 3-for-15 (.200) with 2 HR, 9 RBI, and a .400 OBP...Reached base at least once in each game against HOU. Each of Bradley's hits in the ALCS went for extra bases, came with 2 outs, and drove in multiple runs...He became the 1st player in MLB history to have 3 straight multi-RBI games in the postseason from the No. 8 or 9 spots in the order. His 9 RBI were the most in a postseason series of 5 games or fewer since Robinson Canó in the 2011 ALDS (9), and the most in an ALCS or World Series of 5 games or fewer since Matt Williams in the 1989 NLCS (9). In Game 3 of the World Series at LAD, tied the score at 1-1 with a 2-out solo HR off Kenley Jansen in the 8th inning. In his 5th ML season, hit .245 (118-for-482) with 17 HR and 63 RBI in 133 games... Earned the Sox' Defensive Player of the Year Award from the Boston Baseball Writers. According to Baseball-Reference, ranked 2nd among Red Sox position players in WAR (2.8). Robbed 3 HR: Ryon Healy on 5/19 at OAK, Aaron Judge on 7/16 vs. NYY, and Chris Davis on 9/19 at BAL. Recorded 6 assists and 1 double play. Batted .276 with a .361 OBP vs. LHP (32-for-116, 3 HR)...The only AL left-handed batters with a higher OBP vs. LHP (min. 100 AB) were Shin-Soo Choo (.400) and Joe Mauer (.377). With RISP, hit .284 with an .825 OPS (31-for-109, 4 HR)...Hit .360 with a .484 OBP with RISP from 8/13 through the end of the season (9-for-25, 4 BB, 2 HBP). Recorded at least 1 hit and scored at least 1 run in each of his first 3 games of the season before being placed on the 10-day DL on 4/11 (retro to 4/9) with a right knee sprain...Reinstated on 4/21. Began the season hitting .171 (12-for-70) in 20 games through 5/12...In his remaining 51 games before the All-Star break, posted a .321/.409/.567 batting line (60-for-187, 14 2B, 3B, 10 HR). Hit 5 HR in a 14-game span from 5/16-6/1...Homered in both games of a 2-game sweep at STL from 5/16-17. On 6/9 vs. DET, broke a 3-3 tie with a 2-run HR in the 8th inning of a 5-3 BOS win...It marked the latest go-ahead HR of his career. Hit safely in 22 of 26 games from 6/9-7/5, posting a .369/.430/.592 batting line in that time (38-for-103, 9 2B, 1 3B, 4 HR)...Doubled in 4 consecutive games from 6/28-7/1, the longest such streak of his career. In the Sox' 3-0 win vs. NYY on 7/16-G2, robbed Aaron Judge of a 2-run HR in the 8th inning. Went 2-for-3 with 3 RBI in a 5-1 win on 8/20 vs. NYY...Was his 10th career game with 3+ RBI as a No. 9 hitter. Was 2-for-3 with a HR on 8/22 at CLE, but was placed on the 10-day DL the next day (sprained left thumb). Reinstated from the DL on 9/2...In the Sox' 3-2, 19-inning win over TOR on 9/5, started an 8-2 double play to end of the top of the 11th inning, throwing out José Bautista at home. In the Sox' 1-0, 11-inning win at BAL on 9/19, robbed Chris Davis of a HR in the 5th inning and scored the winning run in the 11th. POSTSEASON: Shared the team lead with 5 RBI in the ALDS vs. HOU...Drove in each of the Sox' runs in their 8-2 loss in Game 2. Hit a 3-run HR in the 7th inning of the Sox' 10-3 win in Game 3. Started the 87th MLB All-Star Game in LF, his 1st appearance in the Midsummer Classic... Tabbed a Rawlings Gold Glove Award finalist for CF and named a Sporting News AL All-Star. Named to 3rd Opening Day roster (also 2013-14) and spent the entire season with the ML club. Hit 26 HR and recorded 87 RBI, after totaling 14 HR and 83 RBI in his first 3 seasons (2013-15)...His 149 hits in 2016 matched his total from 2013-15. Led major league CF with 13 assists...Among American League CF, ranked T-1st in double plays (3) and 2nd in fielding % (.992)...According to FanGraphs, ranked 2nd among American League CF with 11 defensive runs saved. Received the Special Achievement Award from the Boston chapter of the BBWAA for his 29-game hitting streak from 4/24-5/25, tied for the 4th-longest in Red Sox history...Led MLB in AVG (.415), SLG (.783), OPS (1.271), RBI (30), and triples (tied, 3), and paced the AL in OBP (.488) in that time (44-for-106, 9 2B, 3 3B, 8 HR, 14 BB)...According to Elias, became the 1st player with a hit streak of 29+ games while batting 6th or lower in each game since NYY's Joe Gordon in 1942 (29 G)...BOS had MLB's best record during the streak (21-8). BOS went 20-5 in games in which he homered, including 10-0 from 7/29 through the remainder of the season. Hit .339 and slugged .572 when batting 8th or 9th in the lineup (61-for-180, 12 2B, 3 3B, 8 HR)...Among players with at least 100 AB batting 9th, ranked 1st in OBP (.388), SLG (.598), and OPS (.986), and was 2nd in AVG (.341). Recorded the Sox' lone hit on 4/19 vs. TB while batting 9th...It was the 1st time BOS' only hit in a game was delivered by a No. 9 hitter since 9/2/01 vs. NYY, when Carl Everett broke up Mike Mussina's perfect game with a 2-out single in the 9th inning at Fenway Park. Began his 29-game hitting streak on 4/24 at HOU (2-for-6, 2B, 2 RBI)...Drove in Hanley Ramirez in the 12th inning (single) for the winning run. Homered in the Sox' 1-0 win at ATL on 4/25, a 1-out blast in the 7th inning...Became the 1st Red Sox to homer in a 1-0 win since Manny Ramirez did so on 6/16/07 vs. SF...The last Boston player to homer in the 7th inning or later in a 1-0 win was Dwight Evans on 8/25/90 at Toronto (7th inning). Led MLB with 4 triples in April...Recorded his first career 2-triple game on 4/30 vs. NYY...The only other Red Sox in the last 100 years with at least 4 triples before May 1 are Jose Offerman (4 in 1999), Nomar Garciaparra (4 in 1998), and Bill Regan (4 in 1928). Totaled 13 RBI in the Sox' 3-game series vs. OAK from 5/9-11, the most by a Red Sox player in a 3-game set since Nomar Garciaparra had 14 vs. SEA in May 1999...Had 6 RBI on both 5/9 and 5/11, becoming the 1st Red Sox player ever with 6+ RBI in multiple games of a 3-game series, and the 1st major leaguer to accomplish the feat since Geoff Jenkins had 6 RBI on 4/28/01 and 4/29/01 vs. Montreal. Had 6 RBI from the No. 8 spot in the lineup on 5/11 vs. OAK, less than a year after driving in 7 runs from the No. 9 spot on 8/15/15 vs. SEA...According to Elias, he is 1 of only 3 Red Sox ever to record multiple games with 6+ RBI from either the 8th or 9th spot in a batting order...The others to do it were Bill Mueller (6/27/03 vs. FLA and 7/29/03 at TEX) and Brian Daubach (8/14/99 vs. SEA and 6/29/00 vs. BAL). Earned his 1st career AL Player of the Week honor for the period 5/9-15, when he led the majors in hits (tied, 15) and RBI (15) and ranked among AL leaders in AVG (5th, .469), OPS (5th, 1.297), and XBH (T-8th, 5)...Went 15-for-32 with 3 HR, 2 2B, and 6 runs scored in 7 games. Recorded multiple hits and an RBI in 5 consecutive games from 5/9-14, tied for the longest such streak in MLB in 2016...Had multiple hits in 6 straight games from 5/8-13, also tied for the majors' longest streak of the year. Was intentionally walked twice on 5/21 vs. CLE as the No. 7 batter in the Sox' lineup (3 BB total)...The last Red Sox player to draw at least 2 IBB and 3 total BB while batting 7th or lower in the lineup was Tim Naehring on 5/11/96 at TOR (batting 7th). Snapped his 29-game hitting streak on 5/26 vs. COL, going 0-for-4 as the leadoff hitter...Was on deck when the game's final out was made. Named AL Player of the Month for May...In 27 games during the month, led the AL in OBP (.474) and ranked among leaders in AVG (2nd, .381), SLG (2nd, .701), OPS (2nd, 1.175), hits (8th, 37), HR (T-5th, 8), RBI (8th, 24), walks (5th, 17), and XBH (T-9th, 15)...Became the 1st Red Sox to earn the monthly honor since Dustin Pedroia in July 2011. Placed on paternity leave on 5/31 and reinstated on 6/3...He and his wife, Erin, had their 1st child, a daughter (Emerson). Was caught stealing on 6/29 at TB, snapping a streak of 20 consecutive successful SB attempts to begin his career. Recorded 2 assists and a double play on 7/3 vs. LAA...Was his 1st career game with multiple assists. Selected via the fan ballot to start the MLB All-Star Game in LF on 7/11 at Petco Park and went 2-for-2 (2 singles). Homered in 3 of 9 games from 7/21-29 and in 4 of 6 games from 8/14-19...Batted .328 (21-for-64) with 5 HR and a .988 OPS during a 19-game stretch from 8/31-9/20. POSTSEASON: Made his postseason debut, starting each of the Red Sox' 3 ALDS games in CF. Played in 74 games (66 starts) over 4 stints with BOS and named Red Sox Comeback Player of the Year by the Boston Baseball Writers...Led the PawSox in AVG (.305), HR (9), 2B (18), OBP (.382), and SLG (.472) and named an International League All-Star. Hit .121 (7-for-58) with 1 HR in his first 24 ML games from 5/10-8/8, but had a .294 AVG/.366 OBP/.613 SLG/.980 OPS line in his final 50 games in the majors (48-for-163, 17 2B, 4 3B, 9 HR, 39 RBI, 37 R). Recorded 4 assists and was part of 2 double plays as an OF...Combined to post a .994 fielding percentage (1 E/164 TC) while splitting time in RF (32 G, 28 GS), CF (27 G, 25 GS), and LF (17 G, 13 GS). Red Sox pitchers posted a 3.94 ERA (261 ER/596.1 IP) in his 66 starts compared to a 4.57 ERA (433 ER/852.0 IP) in 96 games he did not start. Posted a .306/.390/.528 line vs. LHP...His .528 SLG against lefties ranked 5th in the majors and 2nd in the AL among left-handed batters (min. 75 PA)...Hit 8 of his 10 HR against RHP. Hit .320 (33-for-103) at Fenway Park...Among 166 AL players with at least 100 AB at home, ranked 3rd in SLG (.621) and 4th in OPS (1.013). Hit .326 (29-for-89) in day games...His .663 SLG in day games ranked 3rd in the majors (min. 75 AB), trailing only WSH's Bryce Harper (.705) and TOR's Jose Bautista (.667). Hit .309 (17-for-55) with RISP...Was 4-for-4 with 2 3B, 3B, and 9 RBI with the bases loaded. Recalled by Pawtucket for the 1st time on 4/28 but did not appear in that night's game vs. TOR...Optioned back to Pawtucket following the game...Made his 2nd and 3rd ML stints of the season from 5/10-22 and 6/25-7/3. Went 2-for-4 on 6/25 vs. BAL, snapping an 0-for-30 skid dating back to 2014 (started 0-for-12 in 2015)... Recorded an inning-ending DP in the 9th, throwing out David Lough at home. Recalled for a 4th and final time on 7/29 and started 57 of the Sox' remaining 61 games (CF-24, RF-20, LF-13). Hit .446 with a .489 OBP, .952 SLG, and 1.441 OPS during a 25-game stretch from 8/9-9/7, with 24 of his 37 hits in that span going for extra bases (37-for-83, 32 RBI, 29 R, 13 2B, 4 3B, 7 HR, 7 BB)...During that time, led the majors in AVG, SLG, OPS, XBH, R, and 2B, also ranking 2nd in OBP, RBI, and triples. Went 2-for-3, HR, 3B, BB, 5 RBI on 8/9 at DET...Was the 1st Red Sox No. 9 hitter with as many as 5 RBI in a game since Trot Nixon on 7/24/99 at DET (5)...Was the youngest Red Sox CF with a 5+ RBI game since Ellis Burks had 5 on 8/27/90 at CLE (both 25 years old). Recorded 7 XBH (5 2B, 2 HR) during a 3-game series vs. SEA from 8/14-16, most by any Red Sox in a single series since Dwight Evans had 7 XBH from 8/12-14/88 vs. DET (4 2B, 3B, 2 HR). Set a Red Sox franchise record and tied the MLB record (11th time) with 5 XBH on 8/15 vs. SEA (5-for-6, 5 R, 3 2B, 2 HR, 7 RBI)...At 25 years and 118 days old, was the youngest major leaguer ever with 5 XBH in a game...The only other player 25 or younger with 5 XBH in a game was Larry Twitchell (25 years, 178 days), who accomplished the feat exactly 126 years prior on 8/15/1889 (Source: Elias)...Was just the 3rd player in 100 years with at least 5 XBH, 5 R, and 7 RBI in a game, along with Shawn Green for the Dodgers (5/23/02 at MIL) and Joe Adcock for the Braves (7/31/54 at BRO). On 8/23 vs. KC, broke a scoreless tie with an RBI double in the 2nd inning, gave the Sox a 5-4 lead with an RBI 2B in the 7th, and led off the bottom of the 9th with a single...Also threw out Omar Infante at the plate in the 9th. Had 11 consecutive hits go for extra bases from 8/14-23. Recorded a career-best 8-game hit streak from 8/30-9/7 (.577, 15-for-26, 6 2B, 3B, 2 HR, 11 RBI, 12 R, 2 BB)...Had at least 1 hit and scored at least 1 run in each of those 8 games, the longest streak by a Red Sox since Jacoby Ellsbury's 10-gamer from 5/27-6/12/13. On 9/7 vs. TOR, went 4-for-4, 2B, HR, 4 RBI...Recorded at least 4 hits and 4 RBI for the 2nd time in 23 days (also 8/15 vs. SEA), the shortest span by a Red Sox since Manny Ramirez in 2002. Hit .138 (11-for-80) with 4 2B and 2 HR in his final 25 games beginning 9/8...In the Sox' 7-6 win at TOR on 9/19, snapped an 0-for-21 slide with a game-tying RBI double in the 7th inning and hit a game-tying, 2-run HR in the 9th. Hit 9 HR in his final 50 games of the season after homering 5 times in his 1st 188 ML games. Started in LF for the International League in the 2015 Triple-A All-Star Game (0-for-3, R, BB, HBP)...Was the leading vote-getter in fan balloting. Batted .305/.382/.472 in 71 games with Triple-A Pawtucket (86-for-282, 38 R, 18 2B, 3B, 9 HR, 29 RBI, 30 BB)...At the time of his final promotion, ranked 6th in the IL in AVG, 3rd in OBP, 5th in SLG, and 3rd in OPS (.853)...Started 69 games (67 in CF, 2 in RF) for the PawSox. Recorded 2 multi-HR games in a span of 4 days with the PawSox (7/17 at Durham, 7/20 at Norfolk)...Had multiple hits in 6 consecutive games from 4/27-5/7 (13-for-26, 3 2B, HR). Spent the majority of the season with the Red Sox, leading the club with 125 appearances as an OF...Named a finalist for the AL Rawlings Gold Glove Award at CF...Committed 1 error all season for a .997 fielding percentage (318 chances), 4th among AL outfield qualifiers...His 113 games as a CF ranked 8th in the AL, while his .997 fielding percentage in CF (307 chances) ranked 3rd among all CF qualifiers...His 13 OF assists tied for 3rd in MLB, most by a Red Sox since Jason Bay in 2009 (15)...All 13 came as a CF, the 2nd-most assists by a Red Sox rookie CF in the past 100 years (Ellis Burks, 15 in 1987)...Was involved in 8 double plays, 5 more than any other OF in MLB...It marked the most double plays in MLB by a rookie OF since WSH's Del Unser had 10 in 1968, and T-2nd most by a Red Sox rookie OF in club history (Duffy Lewis, 9 in 1910)...Was the 1st ML OF to have as many as 8 double plays since WSH's Alfonso Soriano in 2006 (9), and 1st Red Sox since Dwight Evans in 1975 (8)...Ranked among AL rookie leaders in runs (T-8th, 45), hits (10th, 76), 2B (6th, 19), SB (5th, 8), and BB (7th, 31)...His 22 XBH were split between left-handed pitchers (134 AB, 9 2B, 3B, HR) and righties (250 AB, 10 2B, 3B)...Was optioned to Triple-A Pawtucket on 3/28, but was recalled on 3/31 prior to the season opener at BAL when Shane Victorino went on the DL..Had 9 XBH (8 2B, 3B) in March/April, most by a Red Sox rookie before May since Shea Hillenbrand had 12 in 2001...Drove in the go-ahead and game-winning runs with a 2-run double in the top of the 14th inning on 4/16 at CWS.....Marked his 1st career go-ahead RBI in the 6th inning or later...Clubbed his only HR of the season on 5/31 vs. TB off Cesar Ramos, the 1st of his career against a southpaw...Reached base in a career-high 7 straight games from 6/7-15 (.407 OBP)...Hit in 12 of 14 games from 6/29-7/21 (.375, 18-for-48, 4 2B, 4 RBI, 5 BB, 11 R)...Broke up Jose Quintana's no-hit bid with an RBI single in the 6th inning on 7/10 vs. CWS...Optioned to Pawtucket on 8/18 and played 16 games for the PawSox, including 2 in the playoffs (.211, 16-for-76, 2B, HR, 5 RBI, 3 BB, 7 R)...Recalled by the Red Sox on 9/5 and appeared in 15 games (9 starts) over the duration of the season. Split the season between Boston and Triple-A Pawtucket after never before playing above Double-A. Reached in 19 of his 32 ML games with a PA over 4 stints with the Red Sox, including 9 of 13 contests with a PA in his final stint with the club beginning 9/7. Appeared in 37 games overall (26 starts) with the Sox, including 14 in LF (10 GS), 19 in CF (16 GS), 2 in RF, and 2 as a PH...Each of last 16 ML starts beginning 5/31 came in CF, including 10 of the club's 19 games after final recall on 9/7. Broke spring training with the big league club...Was just the 2nd Red Sox farmhand since 1981 to make the Opening Day roster without Triple-A experience (also Shea Hillenbrand in 2001)...Other notable Red Sox to do it over the last 50 years include Bruce Hurst (1980), Bob Stanley (1977), and Billy Conigliaro (1964). Made ML debut with a start in LF on Opening Day, 4/1 at NYY...At 22 years old, was the youngest Red Sox OF to start on Opening Day since a 21-year-old Dwight Evans in 1973 (RF) and the club's youngest Opening Day LF since Carl Yastrzemski's 1st 2 seasons in 1961 (21) and 1962 (22). Became the 1st Red Sox to debut on Opening Day against the Yankees since Tony Conigliaro in 1964...Also the 1st Red Sox to make his ML debut with an Opening Day start since Shea Hillenbrand in 2001. Went 0-for-2 with 3 walks, an RBI, and 2 runs scored in his debut...With a 2nd-inning walk off CC Sabathia, became the 1st Red Sox to reach base safely in his 1st ML PA while debuting on Opening Day since Joe Lahoud in 1968...Since RBI became an official stat in 1920, was the 1st player with at least 3 walks, a run, and an RBI in his ML debut...Was the 1st ML player with 3 walks in his debut since MIN's Danny Ardoin on 8/2/00, the 1st Red Sox to do it since Lahoud on 4/10/68. Had 2 runs and an RBI in each of 1st 2 ML games, the 2nd player to do that in 25 years starting in 1989 (Eric Hinske, 2002)…Since 1920, the only other Red Sox to do it was Sam Horn in 1987. Optioned to Triple-A Pawtucket on 4/18 when David Ortiz came off the DL. Played in BOS' first 7 games after 5/29 recall and was optioned back to the PawSox on 6/8...Appeared in 4 games (1 start) during 3rd ML stint from 7/9-13. Snapped an 0-for-21 drought with a 9th-inning single on 5/30 at PHI. Went 3-for-5 with 2 doubles on 6/1 at NYY for his 1st ML multi-hit game. Hit 1st ML homer (off Justin Grimm) and set a career-high with 3 RBI on 6/4 vs. TEX. Scored the game-winning run in the top of the 10th inning on 7/11 at SEA...Pinch-ran for Ryan Lavarnway at 1st base and scored from 2nd on Daniel Nava's 2-out single. Went 6-for-16 (.375) over his last 7 games of the season beginning 9/19. Hit a game-winning, 3-run home run in the 2nd inning on 9/22 vs. TOR. Played 80 games for Pawtucket, his 1st Triple-A experience…Named the No. 8 prospect in the International League by Baseball America…Among IL hitters with at least 300 AB, ranked 6th with an .842 OPS. Paced Pawtucket with 26 doubles, 3 triples, and 39 extra-base hits...Also topped the club (min. 200 AB) with a .374 OBP. Did not commit an error in 68 Triple-A games in the outfield, including 58 appearances in CF, 7 in RF, and 4 in LF... His 165 chances were 2nd most among IL outfielders that did not commit an error. Named the best defensive OF in the IL in Baseball America's 2013 Best Tools Survey...Was Red Sox Minor League Defensive Player of the Month for June. On the PawSox' 7-day DL from 5/4-17 (biceps tendonitis) and 7/31-8/8 (right elbow inflammation). Matched Pawtucket's season high with a 15-game hit streak from 4/30-6/14 (G1)...Hit .439 (25-for-57) with 9 doubles, 1 triple, 2 homers, 11 runs, 8 RBI, and 8 walks during that stretch...Doubled in the last 6 games of that streak beginning 5/26...Had 6 straight multi-hit games from 5/20-27 (.480 AVG, 12-for-25). Went 5-for-13 (.385) with 2 runs, an RBI, and a walk in 3 IL playoff games. Following the season, ranked by Baseball America as BOS' No. 1 outfield prospect (No. 3 overall), as well as the system's best defensive outfielder and as having the system's best outfield arm, both for a 2nd straight year. Selected as Red Sox Minor League Player of the Year by the Boston Baseball Writersafter his 1st full minor league campaign...Also named to Baseball America's 2012 MinorLeague All-Star Second Team.Combined to bat .315 (146-for-463) with 42 doubles, 4 triples, 9 homers, and 63 RBI in 128 games between HighA Salem and Double-A Portland...Tied for 7th among all minor leaguers in doubles and tied for 8th with 87 walks.Led BOS farmhands with 90 runs and 87 walks...Also topped the system (min. 250 AB) with a .430 OBP andranked 2nd among Sox minor league qualifiers in AVG.Was the Red Sox Minor League Defensive Player of the Year...Posted a .973 fielding percentage (7 E/260 TC) between center field (114 games) and right field (1 game).Began the year with Salem and earned Carolina League Mid- and Post-Season All-Star honors.Selected as the organization's Minor League Defensive Player of the Month for April.Named Topps Player of the Month in the Carolina League for May after batting .382 (34-for-89) with a CLhigh 21 walks.Also hit .359 in April (28-for-78) and .336 in June (36-for-107).Reached via hit or walk in a Carolina League-high 29 consecutive home games from 4/13-6/7 (.440, 44-for-100, 23 BB), while posting a league-high 17-game home hitting streak from 4/13-5/20 (.488, 20-for-41).Went 5-for-5 with a double and 3 RBI on 5/12 at Myrtle Beach.Played the entire Carolina/California League All-Star Game on 6/19, batting leadoff and in center field.Led full-season minor leaguers with a .480 OBP prior to promotion to Double-A on 6/21 after the All-Star break...Also topped the Carolina League with a .359 AVG, 53 runs (tied), 26 doubles, and 52 walks in the 1st half and led the Sox with 16 stolen bases.Hit safely in 16 of his 1st 18 Double-A games through 7/7, batting .384 (28-for-73) in that stretch.Following the season, ranked by Baseball America as BOS's No. 1 outfield prospect, No. 2 prospect overall, the best defensive outfielder and as having the best outfield arm and best strike zone discipline in the system.Selected by BA as the No. 1 outfield prospect in both the Carolina League (No. 4 overall) and the Eastern League (No. 5 overall).Rated in Baseball America's Best Tools Survey as the Carolina League's most exciting player, best defensiveoutfielder, best batting prospect, and best base runner, as well as having the circuit's best outfield arm and best strike zone judgment. Appeared in 10 games between Short-A Lowell and Single-A Greenville in 1st pro season.Hit 1st career home run in his final game of the season on 9/4 at Hickory.Following the season, ranked by Baseball America as BOS's No. 3 outfield prospect and No. 10 prospect overall, as well as the best defensive outfielder in the system.PERSONALHit .331 with 30 homers and 133 RBI in his 3-year college career at the University of Carolina from 2009-11...Named to the All-Southeastern Conference Defensive Team in 2010 and 2011.Led the 2010 National Champion Gamecocks with a .368 AVG and was named both the Most Outstanding Player and to the All-Tournament Team at the College World Series.Named a Freshman All-American byBaseball America, Collegiate Baseball, the NCBWA, and Rivals.com...Alsonamed to 2009 SEC All-Freshman Team.Played for USA Baseball's Collegiate National Team in 2010.Hit .275 (42-for-153) in 43 games for the Hyannis Mets of the Cape Cod League in 2009...Led the circuit with4 triples.Attended Prince George (VA) High School...Named to the 2008 Virginia AAA All-State Team. September 2, 2017 Boston Red Sox activated CF Jackie Bradley Jr. from the 10-day injured list. August 23, 2017 Boston Red Sox placed CF Jackie Bradley Jr. on the 10-day disabled list. Sprained left thumb. April 21, 2017 Boston Red Sox activated CF Jackie Bradley Jr. from the 10-day disabled list. April 18, 2017 Boston Red Sox sent CF Jackie Bradley Jr. on a rehab assignment to Pawtucket Red Sox. April 11, 2017 Boston Red Sox placed CF Jackie Bradley Jr. on the 10-day disabled list retroactive to April 9, 2017. Right knee sprain. June 3, 2016 Boston Red Sox activated CF Jackie Bradley Jr. from the paternity list. May 31, 2016 Boston Red Sox placed CF Jackie Bradley Jr. on the paternity list. July 29, 2015 Boston Red Sox recalled CF Jackie Bradley Jr. from Pawtucket Red Sox. July 3, 2015 Boston Red Sox optioned CF Jackie Bradley Jr. to Pawtucket Red Sox. June 25, 2015 Boston Red Sox recalled Jackie Bradley Jr. from Pawtucket Red Sox. May 22, 2015 Boston Red Sox optioned CF Jackie Bradley Jr. to Pawtucket Red Sox. May 10, 2015 Boston Red Sox recalled Jackie Bradley Jr. from Pawtucket Red Sox. April 29, 2015 Boston Red Sox optioned CF Jackie Bradley Jr. to Pawtucket Red Sox. April 28, 2015 Boston Red Sox recalled Jackie Bradley Jr. from Pawtucket Red Sox. April 2, 2015 Boston Red Sox optioned CF Jackie Bradley Jr. to Pawtucket Red Sox. September 5, 2014 Boston Red Sox recalled Jackie Bradley Jr. from Pawtucket Red Sox. August 18, 2014 Boston Red Sox optioned CF Jackie Bradley Jr. to Pawtucket Red Sox. March 31, 2014 Boston Red Sox recalled Jackie Bradley Jr. from Pawtucket Red Sox. March 28, 2014 Boston Red Sox optioned CF Jackie Bradley Jr. to Pawtucket Red Sox. November 1, 2013 Jackie Bradley Jr. roster status changed by Boston Red Sox. October 4, 2013 Boston Red Sox reassigned CF Jackie Bradley Jr. to the minor leagues. September 7, 2013 Boston Red Sox recalled LF Jackie Bradley Jr. from Pawtucket Red Sox. August 9, 2013 Jackie Bradley Jr. roster status changed by Pawtucket Red Sox. August 1, 2013 Pawtucket Red Sox placed LF Jackie Bradley Jr. on the 7-day disabled list retroactive to July 31, 2013. July 14, 2013 Boston Red Sox optioned LF Jackie Bradley Jr. to Pawtucket Red Sox. July 9, 2013 Boston Red Sox recalled Jackie Bradley Jr. from Pawtucket Red Sox. June 8, 2013 Boston Red Sox optioned Jackie Bradley Jr. to Pawtucket Red Sox. May 29, 2013 Boston Red Sox recalled Jackie Bradley Jr. from Pawtucket Red Sox. May 17, 2013 Jackie Bradley Jr. roster status changed by Pawtucket Red Sox. May 4, 2013 Pawtucket Red Sox placed LF Jackie Bradley Jr. on the 7-day disabled list. Right bicep tendinitis. April 18, 2013 Boston Red Sox optioned LF Jackie Bradley Jr. to Pawtucket Red Sox. March 31, 2013 Boston Red Sox selected the contract of Jackie Bradley Jr. from Portland Sea Dogs. February 9, 2013 Boston Red Sox invited non-roster CF Jackie Bradley Jr. to spring training. June 21, 2012 Jackie Bradley Jr. assigned to Portland Sea Dogs from Salem Red Sox. April 4, 2012 Jackie Bradley Jr. assigned to Salem Red Sox from Greenville Drive. March 25, 2012 OF Jackie Bradley Jr. assigned to Boston Red Sox. September 1, 2011 Jackie Bradley Jr. assigned to Greenville Drive from Lowell Spinners. August 23, 2011 Jackie Bradley Jr. roster status changed by Lowell Spinners. August 18, 2011 OF Jackie Bradley Jr. assigned to Lowell Spinners from Boston Red Sox. August 15, 2011 Boston Red Sox signed OF Jackie Bradley Jr..